DHAKA: The publisher of an atheist writer killed earlier this year by suspected Islamists was hacked to death in Bangladesh yesterday, hours after two secular bloggers and another publisher were also attacked. Both attacks in the capital Dhaka-the latest in a wave of violence targeting secular activists-followed the same pattern, with the assailants attacking the men with machetes and cleavers, leaving them in a pool of blood and padlocking their offices from the outside as they left, police said. Faisal Arefin Dipan, 43, the owner of Jagritee publishers, was killed in his third-floor office in central Dhaka, his father Abul Kashem Fazlul Haq, a noted intellectual and writer, told AFP. “I rushed to his office at Aziz Market and broke the padlock. And I saw him lying upside down in a massive pool of blood. They slaughtered his neck. He is dead,” he said. Police also confirmed Dipan’s death. Haq told AFP that he became worried about his son after he heard of the earlier attack that left publisher Ahmedur Rashid Tutul, 43, and bloggers Ranadipam Basu, 50, and Tareq Rahim, 30, who is also a poet, severely injured. “He published the books of Avijit Roy. They also attacked other publishers of Roy but only my son died,” Haq said. Atheist blogger Roy was hacked to death outside a book fair in Februarythe first death in the wave of violence against secular writers in Bangladesh. The total death toll this year now stands at five. In the first incident yesterday, three armed men posing as shoppers entered the offices of Shuddhaswar publishing house at 3pm (0900 GMT), police said. “Once inside, they started hacking Tutul, the publisher of Roy, and secular bloggers Basu and Rahim with machetes and cleavers indiscriminately and shot at Rahim from a firearm,” said Dhaka police deputy commissioner Wahidul Islam. “They then padlocked the office from the outside and left the three in a pool of blood. Our officers broke the door and rescued them after getting emergency calls,” he said. The three men were in hospital and one was in a critical condition. Al-Qaeda in the Indian Subcontinent (AQIS) claimed responsibility for the attacks via Twitter. “These two atheistapostates have published books that have attacked the honour of the Prophet Mohammed (PBUH) and mocked Islam”, the group said in a Bengali statement posted using the Twitter handle Ansar al Islam. Police spokesman Muntashirul Islam said officers had seen the statement, but could not confirm whether the Al-Qaeda branch was responsible for attacks. “We’re investigating whether the claim is credible. So far it seems the attacks were pre-planned and carried out by organised miscreants,” Islam told AFP. Hundreds of activists held an impromptu march in Dhaka yesterday evening, criticising the government for failing to protect the country’s secular writers. “We’re stunned. One after another secular writers and bloggers have been silenced and murdered. 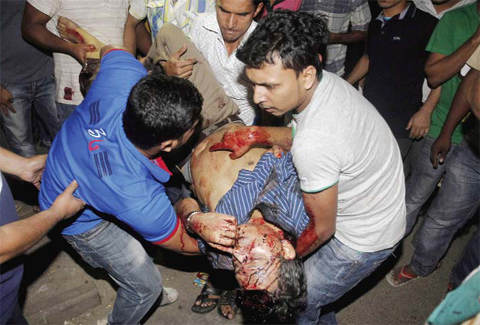 Yet the government has failed to protect them,” said Imran Sarker, who heads a secular bloggers group. Asif Mohiuddin, a Berlin-based Bangladeshi atheist blogger who survived a machete attack by Islamist militants in December 2013, also berated the government for not doing enough. “The country’s bloggers have sought protection from the government and yet there have been no visible efforts to ensure their security,” he told AFP by telephone. He said about a dozen secular writers have fled the country following threats from the Islamists and the latest attacks would prompt more to do so or go into hiding. Police have said the banned local Islamist militant group Ansarullah Bangla Team (ABT) were behind the previous attacks, which were also claimed by Al-Qaeda in the Indian Sub-continent. Tensions are high in Bangladesh following the recent killings of an Italian aid worker and a Japanese farmer, who were shot dead in attacks claimed by the Islamic State group.